December, and all that holiday stuff. I promised holiday stuff throughout the month of December, and I'm determined to deliver. Let's begin at the begin, shall we? 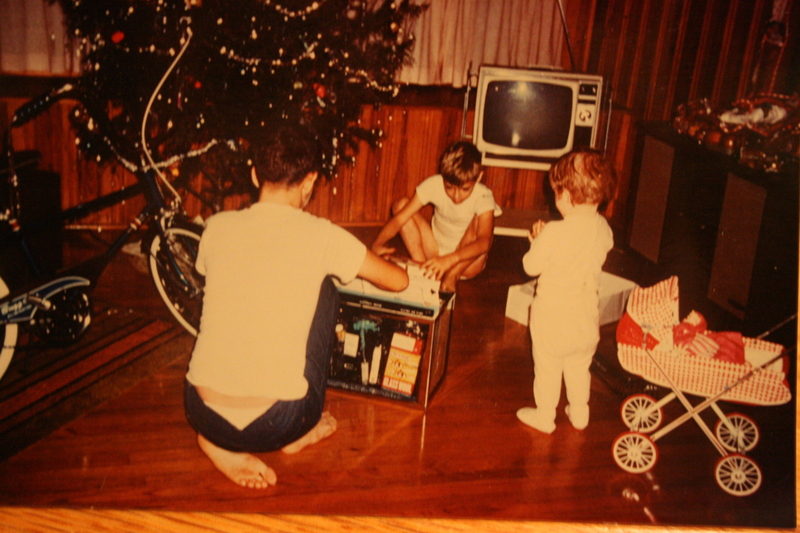 As far as holiday traditions go, my family was what you could call piss-poor. We put up a nativity scene every year, a papier mache set from Sears. Not only were the figurines a lot of fun to play with, I remember they all had thin paper on the bottoms. I liked poking my finger through the paper. Guess it's a kid thing. The set came with wooden creche and the ubiquitous straw, all the animals, the obligatory Jesus, Mary, Joseph and three kings, but it also had this cool shooting star made of gold-covered cardboard. I don't know why that fascinated me so, but it did. It fascinated me so much I played with it 'til I bent it. Another kid thing. In the back of Bethlehem's version of the Motel 6, there was a little light bulb that put out an amazing amount of heat. I couldn't count the number of times I burned my hand on that baby, arranging and re-arranging the straw and all the holy dudes. It was as close to religious obsession as I'd be again for at least another decade, at which point I'd get really into the Catholic thing. But that's way out of range of this era. The nativity's place of honor was on top of the TV, all but guaranteeing our gaze would occasionally stray its way, mostly during commercials. I have a great photo of me in front of the TV/nativity. I wish I could find it so I could post it. Unfortunately, I think my parents have the only copy, so it may as well be in hell as far as my incentive to retrieve it. In the photo I was a pudgy five or six year old, smiling widely to show off my two missing front teeth. My smile's so broad, and so forced, as to almost appear maniacal. In lieu of that I'll post another, much earlier version. That's me in the footie p.j.s, in case you had a doubt. I am the only girl in the family. I don't remember the TV in the picture. Hell, I don't even remember getting a baby buggy and doll. But that weird looking stereo to my immediate right, that I remember. I used to play records on that pathetic "Hi-Fi" up until junior high at least. They sure did build those things to last. A little too long. 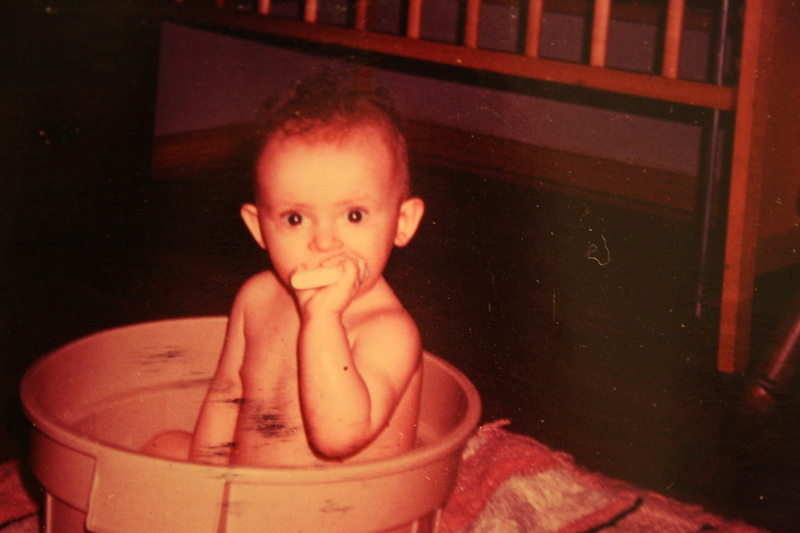 Me, as a toddler. My oldest brother with his underwear showing, and my middle (and STILL OLDER) brother wearing nothing but underwear. In my entire childhood I only remember going to see Santa once. He was aboard some weird rocket ship, because, as every child knows, Santa is an alien. I recall riding around the parking lot at a local Kmart (for those not in the U.S., think the cheapest department store you've ever been in, then imagine it two times cheaper than that), though I was easily tricked into believing the "stewardesses", in their obligatory short, red skirts, that we were flying to the North Pole. Knowing me that probably threw me into a moment of existential angst, wondering what it would all mean if we showed up at Santa's toy shop – if he'd still give us presents and send us home via rocket, or if he'd return us by stuffing us back down chimneys. Luckily for us, Santa returned us to the Kmart parking lot, none the worse for wear after our 10 minute trip to and from the North Pole. I remember him going from seat to seat, asking what each child wanted. And I recall screeching at such a high pitch it's surprising the windows in his spacecraft didn't shatter. No wonder he never invited me back. A second thing I remember are my Christmas Eve dreams. They were always the same, grandiose imaginings of what would await me in the morning. The stack of presents was a wall of brightly colored wrapping paper stretching from floor to ceiling, like a brick wall, only shinier and prettier. And every, single gift was for me. As for my brothers? Who cared! Every Christmas Eve was the same. My parents sent me off to bed while they stayed up watching TV. I was so upset with them, since their not going to bed was keeping Santa from coming. Every child knew Santa didn't squeeze his big derriere into the dryer exhaust pipe (we didn't have a chimney) until every soul was in bed asleep. Their refusing to go to bed drove me mad with frustration. It also drove me out of my room roughly every five minutes to yell, "You'd better go to bed!" I couldn't sleep from all the excitement. When I wasn't yelling at my parents I pressed my little nose to my window, expecting to see Santa and his reindeer doing a flyover while my parents watched Johnny Carson. There was a tower with a blinking red light a mile or so away from my house. Though it was out there every night of the year, for some reason on Christmas Eve I was convinced the light was Rudolph's nose, blinking away my chances for a wall of presents. Eventually I'd crawl into bed and to sleep, exhausted at last, visions of sugar plums etc., etc..
As for Christmas morning itself, I have no memory of waking up early and calling the family to go see the haul Santa left. I know I must have done it. All I remember is my father sleeping on the sofa, wearing a t-shirt instead of a proper shirt, snoring away while we kids ripped the wrapping paper off our gifts. There were stockings hanging somewhere, but since we didn't have a fireplace I assume they were nailed to the wall or something. I don't remember what we got. Candy, probably. The stockings never rated as highly as the presents. The closest I got to that infamous wall of presents happened the year I got both Barbie's townhouse and her jet. That must have cost my parents a fortune at a time I know they didn't have it. My mother bought all our presents from the Sears catalog, since she didn't drive. I wonder where she got the money for such lavish gifts, and how much trouble she got into for it. My family always had an artificial tree. I don't remember the lights, or even most of the ornaments, but I know the tree was fake, though we children desperately wanted a real tree. I don't recall any kind of celebratory meal, either. No big Christmas breakfast, no big dinner. I assume I played the rest of Christmas day. I honestly have no other memories of the holidays. Kind of sad, in a way, but then again maybe there's a reason I blocked the rest out, just as I've blocked out huge parts of my childhood. Because of my own family's lack of anything resembling tradition, I've made sure things are very different with my own family. But that's a subject for another post. I'll leave you with the image of little Lisa, nose pressed to her window, heart lifted up with the hope she was one of the elect few who'd seen Santa, and that he and his rocket ship would land on her roof at any time. Because that's one of the rare good times I had as a child. Now you've been there with me. Kind of makes you feel all warm and fuzzy, doesn't it? We've just had a magic moment. let's not spoil it with my usual sarcastic comment, though it does take every ounce of restraint I have to avoid it. Next Post And yes, I’m totally jealous.